This entry was posted in Home-Made Pastas, Pasta/Rice/Soups (Primi Piatti), Sauce/Gravy (Ragù/Sugo) and tagged Food, Italian, Pasta, Recipes by ChgoJohn. Bookmark the permalink. There’s nothing like homemade, is there? Thank you for the recipe and the tour! Great photographs!!! You’re very welcome, Arlene. I’m glad you enjoyed the post. I enjoy all of your posts!!! Will you ever get a book out? Or am I late to the party on that one??? Of course we’d be interested! Thanks John, I learnt something today. I hadn’t heard of a chitarra before. Thank you! Ok – now that you have gotten me all hot and bothered remembering . . . I so recall my younger daughter standing at an almighty early hour on her veranda overlooking the Arno: ‘Mommy, are we in fairyland?’ . . . Not in Florence nor later in Venice did we ever have any problems with our kids , , , it was just magic as it is with you now 🙂 !!!! I just lovingly scroll all your photos and cannot wait for the next lot!!!!!!!!!! Thanks, Eha. I’m so glad you’ve enjoyed this post and that daughter of yours really nailed it. Florence really is such a mystical place that there should be fairies flitting about. Going through my photos, selecting them for these posts, is taking me quite a bit of time. Though the memories are still fresh, the photos add a dimension to them and I find myself stopping to ponder each one. I cannot get back there soon enough! Have a good week, Dear. Oh dearHeart, daughter-of-mine these days had her very own thoughts but I doubt feeling ‘fairness’ ever changed!! OK – Venice won out with both her ‘important’ relationships! Both just HAD to make it formal there!!! So much for the Florence I love 🙂 !!!!! Oh John, don’t tempt me 😉 ! More likely tho’ that I’ll meet you for lunch in Chicago-town during the next year or three!!!! Hurrah!!!!!!! That is a date Signor A!!!!! Sugar . . . . I just picked the meaning of this one up . . . interesting, ChGo John 😀 !! Hugs . . . . probably – not . . . .
Cut the last sentence . . . obviously not meant to sound the way it did, but oh so great if I am reading this right 🙂 !!!! Gorgeous post. Amatriciana is one of my favorite pasta dishes! Looks so good. I’m jealous of your trip too, seems amazing! I have to say, John, that your own handmade pasta and plating/presentation of your Amatriciana looks so much better than the dish you were served in Rome! I’m sure they both tasted great though. Very nice pasta harp btw and smart move to buy it locally so that you can get it restrung if need be. I love the photos of your trip and love it even more that you are recreating dishes that you were served while you were there. I’m sure she’ll like it if not for it’s true utility than perhaps for it’s potential musical capabilities and well it sure is a talking piece! I was a little embarrassed before to mention that we always cut our pasta by hand when I was a kid (one of these would have definitely come in handy) but if it’s good enough for Zia than it’s definitely good enough for me! Two for the price of one, a delicious dinner followed by a guided tour of the highlights of Florence. Thanks John! Ohhhh:-) WUAOOOO John!! Simply Amazing!!!! It still amazes me your skill with making pasta and that was some trip! What a wonderful looking meal. Nothing beats a simple meal with fresh ingredients. The memories also add a wonderful element. All those photos have me longing to go back to Italy! Exactly! This is about as traditional as an Italian dish gets and it’s basically 3 ingredients. My Zia laughs when she watches modern TV chefs prepare an Italian dish using a dozen ingredients. Let the ingredients do the talking. E.g. was asking me last night where I’d like to travel to next, and I was saying I’m content to stick close to home now, and explore New England by car, maybe take a bus tour to NYC… that was before seeing this post. Bienvenutto! We’ll need a traduttore for the trattorias. Sometime before the twentieth century leaves its teen years, no? That chitarra looks fantastic – it’s so good to see something well made of metal and wood instead of plastic. Similarly the pasta looks delicious and it’s just in time for the amazing English tomatoes that the farmer has at the market here. It is a well-made piece, MD, and I agree. No plastics! I, too, head for the churches, especially in Florence. The amount of fine art to be found in them is really astounding. Add to it the tombs and each cathedral’s architecture and each is a museum in itself. I really need to make this one. Your version, of course, looks delicious. It was packed when we were there as well. Rome was fascinating as a whole. I’ll definitely go back. Beautiful photos John – you will have the memories of your trip fresh in your mind each time you look through your photos. Another fabulous post John. What a beautiful Chitarra you managed to acquire… looks like you’ve mastered it already too! I’ve never seen or heard of them before – happy to learn something new. Thanks, Margot. A chitarra is really quite easy to use. Once I got the hang of it, the pasta was just flying off the strings. And it’s a great reminder of my last day in Rome, going from housewares shop to shop, looking for one. That does sounds like a wonderful holiday, Margot. I do hope you can get back there. It’s such a nice place to visit and stroll around. I hated to leave. That’s a pasta dish I can get behind and with a big supply of golden cherry tomatoes I’ll have to give this a whirl. The trip photos are really inspiring. I’ve thought about getting a chitarra, but haven’t pulled the trigger yet. I just don’t make that style of pasta that often. And there’s a restaurant that’s a 20 minute walk from my house where I can buy fresh pasta in that shape (and others, if I choose). So I guess my motivation is lacking. 😉 Great dish. I often put onion in my Amatriciana, but then I’m an American. 🙂 I do know it’s not authentic, but it’s good. Love hearing about your travels — thanks. I bought the chitarra at the same place I buy my ravioli molds. I believe I’ve already gave you the website. If not, here’s the link. An excellent investment in your new instrument. How cool that it is made in America? Looks like you put it to immediate good use. Oh, that I lived closer. I enjoy seeing your photos and reading about your travels. I’ve been to Italy twice but one trip calls for another. I appreciate your sharing the sights to we can travel with you vicariously. Thanks, Ruth. Nothing would please me more than to have you over for a pasta dinner. Better still, have yo come over a little early and I’d teach you how to make some for yourself. Copious amounts of wine would be involved, of course. 🙂 You’re so right about Italy. I’ve been there a half-dozen times and each has left me wanting to go back even more. It’s a remarkable place, to be sure. What a wonderful piece of equipment to own! I can see why you wouldn’t give up on acquiring one. Your photographs are stunning! 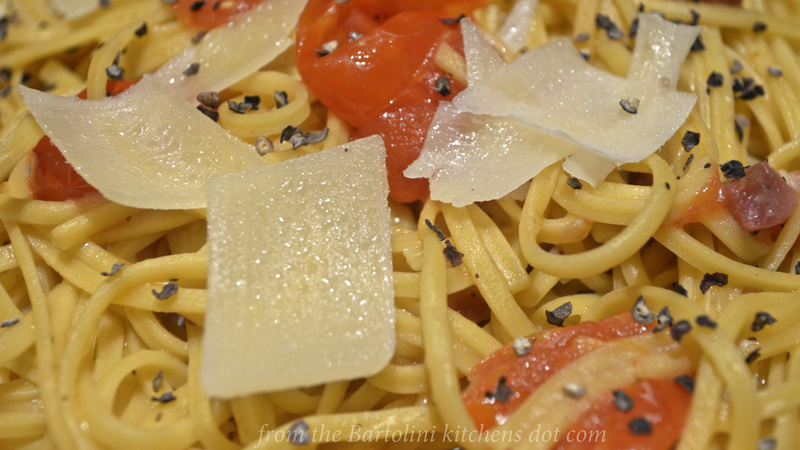 That chitarra is such an interesting piece of equipment and the dish you created with it is so wonderfully simple. Me, too, Ingrid. Too bad I couldn’t erect a scaffold so that I could get a better perspective on the stained glass and frescoes. That chapel is such a beautiful thing to behold, as are all of Florence’s cathedrals. Such a wonderful city! that’s a beautiful plate of food! so colorful…love cherry tomatoes & cheese! Don’t forget the pork. It’s what flavors the dish and, boy, is it ever good! Your pasta looks delicious John and the memories it brings you are an added bonus I am sure. Thank you for sharing some of the photos you took. The inside of the church looks amazing – each part of the church was created by true artists. Thanks, Collin. 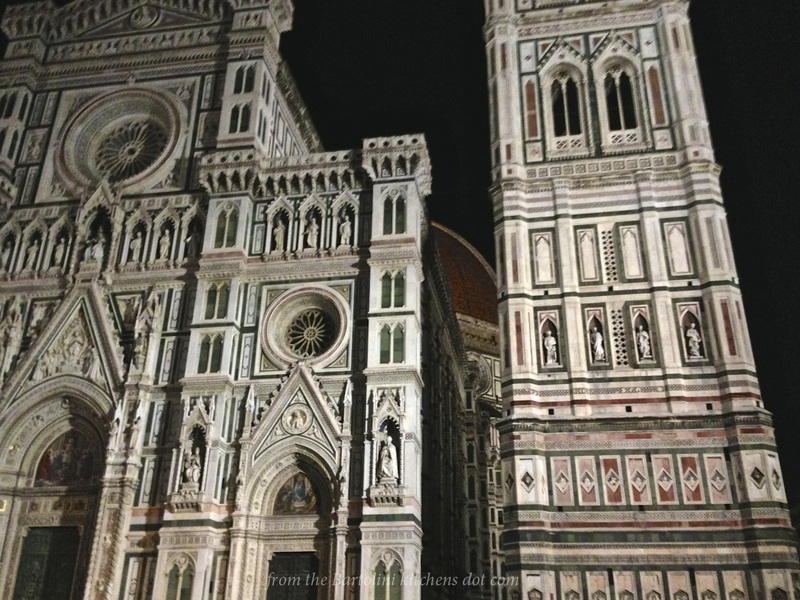 Florence’s cathedrals are something to see! The architecture of each reflects the architect’s vision, of course, but also the religious order that was to be in charge of the church once built. The sensibilities of the Dominicans were taken into account in the design of Santa Maria Novella, for example, while the Franciscans were considered when plans were made for Santa Croce. 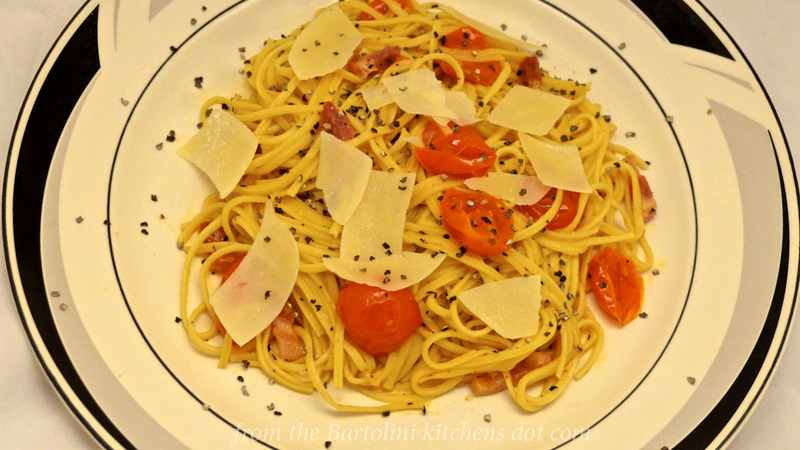 I often cook Amatriciana, of course, but I prefer Bucatini instead of Spaghetti alla Chitarra. I do love that little noise everybody makes eating this kind of pasta! I like Florence, but it is not my favourite town… have you never seen Venezia?! Once again, Silva, your words leave me smiling. (The “little noise.”) I, too, made Amatrciana with Bucatini but really enjoyed this dish when it was served to me in Rome. Besides, what better way to christen my chitarra? I’ve been fortunate to visit Venice 3 times, Silva, and thoroughly enjoyed my time there. It is such a beautiful city and I can see why you love it so. I do hope you make it to Florence, Betsy. It is such a beautiful place. It’s a trip you won’t forget and, no matter how long you stay, it won’t be enough. Trust me. My Aunt makes a version of this, It’s delicious!! I bet it is! It’s a great dish! Thanks, Richard. I must admit that I’ve already used the chitarra far more than I thought. With just a little bit of experience, you can really fly and make quite a bit of pasta relatively quickly. I love that thing! It looks like so much fun. You remind me though that I only got to spend two days in Florence and it was way too long ago. It is one place that never fails to impress me. One day i will go back and I hope sooner rather than later. I could have spent two days just staring at David, if the guard hadn’t pushed me along! 30 years, Fae? You are long overdue to return. I think you’ll find that, except for the crowds, little has changed. 🙂 My first time there was about 25 years ago. How time flies! A quick question… how did you get the “☆ Like” at the end of each comment? I think it is a great addition. Go to your DASHBOARD and click on SETTINGS. Under SETTINGS, click on SHARING. Almost at the bottom of the SHARE SETTINGS page, you’ll see the words “Comment Likes are”. Place a check in the box that follows. “Like” buttons should then appear after every comment. Please don’t hesitate to ask if you run into any problems. Good luck! It worked. Thank you very much for your directions. I love your photos, John. The stained glass is just breathtaking, as is all of Florence, I’m sure. I have never been, and I know I would be in heaven! Your search for a chitarra reaffirms that you are an authentic Italian cook. Not sure about the syntax there. LOL! I already know you’re authentically Italian, but you know my meaning. 🙂 You don’t cut corners on effort when you want to create a delicious meal, and this pasta looks just amazing. 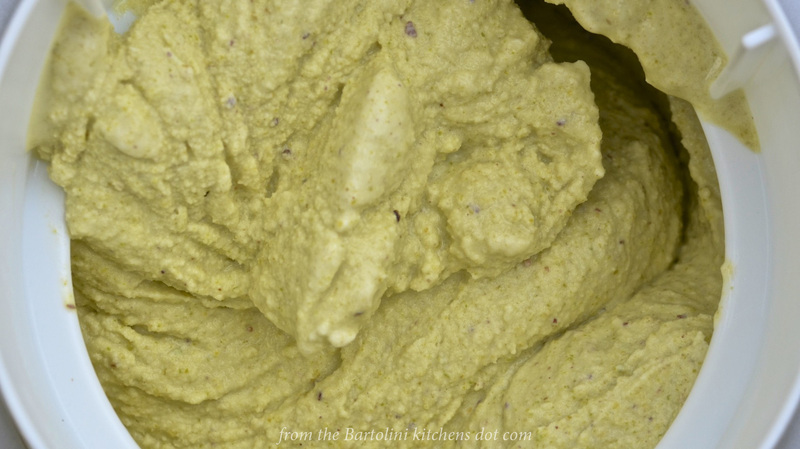 I love that it has three ingredients, and what flavorful ingredients they are! Mouth-watering. I’m certain that every time you use your chitarra, even though purchased in the U.S., you’ll be transported to your favorite city! Debra, you would fall in love with Florence. I promise. There is just so much to see that, no matter how much time you set aside, you won’t see everything. Like most, you’ll find yourself saying things like, “Let’s skip Cathedral X with works by the master Y so that we can go to Cathedral Z and see master A’s works.” Where else in the world is such a statement possible? Let me echo the compliments on the pics John. One thing I love about Italy, as a enthusiatic ‘snapper,’ is that there’s so much subject matter! Strangely enough I was looking at one of these chitarra pasta cutters the other day, I knew I should have bought it…Great pasta as always John. Thanks, Phil. I remember going to Italy before the digital age. Every click of the shutter meant a larger bill back home when it came to developing the film. Now, the opposite is true and I’ve got hundreds of pics to wade through, many of which get deleted. As it turned out, I’m very glad I bought this chitarra from a place here in the States. It’s a far sturdier piece of equipment than those I had seen while touring. Being a gadget lover, a chitarra is a perfect addition to the mix. What a cool tool for making pasta! I’ve never seen one. I’ve been considering buying a pasta machine (thanks to all of your wonderful homemade pasta), but after seeing the chitarra, I think I would prefer it instead. It’s more organic. 🙂 Sounds like you actually did better getting a good one by NOT finding one in Rome. The pasta and the resulting dish are look heavenly and I’m sure taste as good as it looks. Thanks for another great recipe and for sharing your travels to Florence. The pictures are lovely!! Thanks, MJ. I agree and I think this chitarra is a better piece than anything I saw. It’s surprisingly fast to use, too. I can really whip out a batch of pasta in no time — and I’m still a novice with it. With or without a chitarra, you should try this pasta dish. Ready if minutes, it is soo easy to prepare and the quanciale adds such a great flavor to the dish. I really like it. You’ve outdone yourself my friend – you ‘brought’ us on a delightful trip to Florence, gave us all kinds of fascinating info. about ‘how to make pasta on a guitar’ LOL and, in your spare time, included a delicious recipe. WE LOVE YOU JOHN !! Grazie, Tanya. You wold not have believed how crowded the Treve Fountain area was. We were there on Thursday and it was bad. I fought my way to the top of the steps, took a pic, and we left. I returned by myself on Friday to toss the coins and it was worse. I couldn’t even get to the steps. 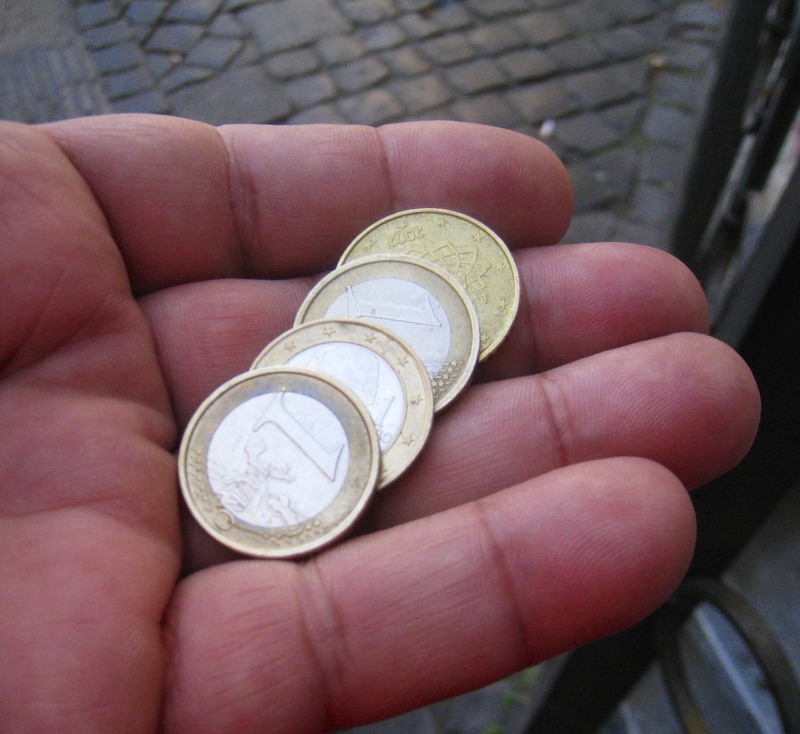 I tossed the coins over everyone’s heads and headed for gelato. I wasn’t even in front of the fountain 5 minutes. I’ve been there several times and this was by far the worse. I didn’t see anyone else toss any coins, though, so I’m sure it won’t be so crowded when I go back. Amateurs! I’m glad you enjoyed the post, Tanya. Have a great weekend. This pasta sounds incredible, and that pasta tool is so awesome. I’m dying to go to Florence!! Love the photos. Oh, Caroline. I cannot state strongly enough that you should get over there. You will be amazed. It is one of the few places on earth that not only lives up to the hype but far surpasses it. Incredible! Thanks for the lesson on Chitarra, learnt something new today. Thanks also for taking me along on your tour, those stainglasses are magnificent. If only I could spend a year in Italy to learn about the culture, history and the food. Especially the food, I would probably return to the USA looking like the Good Year blimp. Hello John! Since you seem to be a huge … amatriciana fan 🙂 , let me pass you on a little piece of information that maybe you don’t know. One of the key ingredients is a grated pecorino cheese from Amatrice itself, which must not be confused with Roman pecorino cheese as the flavor of the former is much more delicate than the latter’s. That’s why some experts say that the suggested substitute is Parmigiano cheese because the strong flavor of Roman Pecorino would alter the taste of the sauce … although I know as a fact that a lot of Romans (including my friends and my mother) use the Roman Pecorino. A really delicious looking meal, John. You certainly have a way with pasta. 🙂 I really enjoyed your photos of beautiful Florence. Thanks and I’m glad you enjoyed the post. Pasta looks amazing. 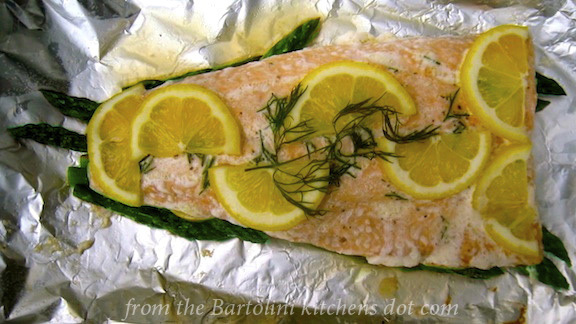 And if we ever catch any fish I am definitely trying one of those fish recipes! What a neat-o pasta-making machine. It’s quite fascinating, really… I think I need one, too. As for the pasta, it’s 6:04 am where I am and I am CRAVING this dish! Yes, for breakfast! I love the photo of the horse-drawn carriage. Those horses are so beautiful! I’m so impressed John! Not only are you a master at pasta but you even know how to play the Chitarra! Why the next time someone pulls out and accordion you can do a duet. Those are wonderful photos of Florence and the expertise of the photographers can never do that city justice. When my daughter studied in Florence, her apartment was at the end of the Pontes Vecchio across from the Medici Palace. The gardens and view were magnificent. I think I like the looks your spaghetti better than what you had at the restaurant. Beautiful looking dish and so simple. Yes, Diane. Look for me and my chitarra on YouTube. Yes we did visit and it was wonderful having someone who knew the city and could be our interpreter. I would go back there in a heartbeat. Three times lucky? Yes, I’m having a dreadful time commenting on my iPhone on the crappy 3G network at the cottage. My first two attempts disappeared into the universe, never to be seen again! Hopefully John from another dimension is enjoying them! Your souvenir is much like my souvenirs; twice I dragged cast iron home, once from Paris, a crêpe pan, and another from Illinois, a pizza pan! Your pics of Florence bring back fond memories; we were there in 91. We drove from Zurich (we were staying with friends) and after an hour of trying to get to our hotel (one-way streets, the wrong way), we had to hire a cab and follow him. He drove down one way streets the wrong way to get there! That was our mistake! Our hotel was in the square of Santa Maria Novella, our room faced the square. We were perplexed because our enormous windows had ‘garage door’ shutters. Metal doors that were lowered by a motor. At 3am, the revellers emerged and we were no longer perplexed. Down came the doors and we were transported to the ‘cone of silence’. That $300 a night room (JTs company paid) gave me lice bites on my arms and legs! It was in Florence that I realized my four years of studying art history at university; there is nothing like the real thing! We waited an hour in queue to see David. It was also the first time we used a bank machine abroad and got local currency! It was also that trip that introduced us to balsamic vinegar! JTs company bought equipment in Modena that we inspected. The family that made the machine took us to a local restaurant where we ate, quite possibly, the best steak ever! Marinated in 100 year old balsamic! The English speaking sales rep then took it upon himself to drive an hour out of his way to buy me my first bottle of 45 year old balsamic! Thank you again dear friend, for bringing back such fond memories. Your new pasta maker has already become such a useful instrument in your kitchen, it really makes beautiful pasta. And I too agree that your version is lovelier than the one from Rome. You’re such a good friend, Eva, to continue to try to post after the universe ate your first 2 attempts. It sounds like your trip to Florence was indeed wonderful. You left with some wonderful memories and a fantastic bottle of Balsamic. I’ve been there 6 times now and each time I’m more impressed than previously. I can see how it could be overwhelming for someone with your art history education. I often wonder what it would be like to live in Florence, to walk those streets as my commute to work. Talk about living the dream! We didn’t see David this trip. The lines were far, far longer than we’ve ever seen and none of us felt like waiting. That’s the nice part of returning to Florence. There’s no pressure to see things that you’ve already had the pleasure of viewing. I’m glad you were persistent, Eva, Yours was a lovely comment. Thank you. JT and I often try to imagine living overseas in a city we adore too. If I had a do-over I think I’d up and spend a year in Europe. Maybe in our retirement! Did you bring extra chitarras with you? Sounds like something I would like to learn how to use. After all the excitement of owning a chitarra has died down, I probably would stash it away in a corner and forget about it. Next time you’re in Rome, buy the first few pieces you see. No need saying you’ll go back then time runs out and you come back empty handed. Good to know it’s available online and you finally got one. 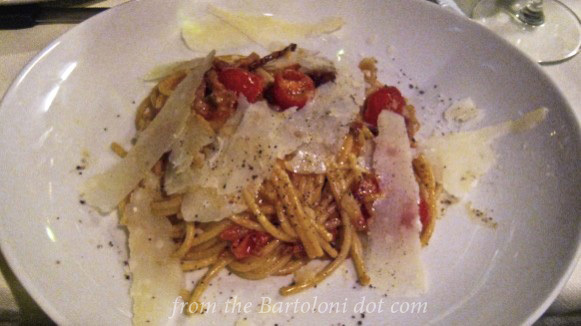 The Spaghetti alla Chitarra all’Amatriciana looks good (I can’t pronounce it). I’m glad it has only three ingredients. Thanks for sharing! Buongiorno, BAM! Yes, that trip was inspiring, on so many levels. Having been there so recently, you know how wonderful that city really is. I think it must be all the walking that kept you slim. Think about it you walked everywhere. In Chicago, maybe you walk to the city transport but not as much as in Italy. Or it could be all of those limencellos that are slimming… LOL I brought my allotment of porcino mushrooms, pasta, olive oil, balsamic vinegar and anything else I could smuggle back into Hong Kong. I think the customs officers just said to themselves, oh my goodness.. I am just tickled pink that you were able to go home for a visit. I am grinning ear to ear.. Missed you. That is a very good thing! Happy for you! great to read about your adventures, as usual! So sorry, Sally, that you’re still having problems. I’m still not getting a few, too. I’ve joined Bloglovin and try to keep track of them that way. If and when WP gets its act together, I’ll drop Bloglovin but, for now, it’s more reliable. Thanks for the kind words. I’m loving this chitarra more every time I use it — which is so often as to border on embarrassing. 🙂 If you’re still interested in a chitarra, Sally, I can send you the name of the company that sold me mine. I’ve bought quite a few pieces of pasta making equipment from them. Never had a problem. That’s a beautiful and an informative post John. The world has so many hidden gems. Never heard of chittara before, but makes so much sense for something like that to exist. Amazing! I’m not sure which pictures have me longing more – the spaghetti or the scenery. Equally wonderful I should think. You have inspired me to get my pasta maker out again. It’s been far too long!